Only the things on the top of this page are "new". The bottom is very old. Links to key art and information for the convenience of busy arts professionals. Performance with Bodil Fox at the Canessa Gallery, April 18, 2018. Documentation by Gabe Mulford, (Murder Media) and Steven Peterson-Gomez. Finally we have great documentation of an entire piece. I made several portraits as gifts recently late 2017. This is my grand nephew Rhett, this is Matt and Maria, and here is Liv and Mango. Bodil and I collaborated on a sound sculpture for Drop By Drop: A Brief History of Benicia Water through the Eyes of Its Artists, at the Benicia Historical Museum, July 26, 2017 - May 27, 2018. WW II - 1, WW II - 2, and WW II - 3. Bodil and I collaborated on an installation, September-October 2016, at Temple Lofts Gallery in Vallejo for Wild by Nature, an exhibition curated by Celeste Smeland in association with Visions of the Wild, a festival organized by the Vallejo Community Arts Foundation. Birdhouse featured a bamboo structure with pleated paper exterior and fennel-scented interior, paper and bamboo birds and butterflies, and four motion sensor controlled motorized bamboo and concrete mobiles attached to the ceiling. Here is a piece I made during my residency at Montalvo in 2016. I worked on this painting for half of 2013. There are a few videos here, and lots of photos here. My brother Timothy Pierce Fox, and mother, Nova June Fox died in November and December of 2006. Bodil and I made a Dragonfly Ornithopter for the DuPage Museum near Chicago. The Crank thing has taken off. We have an Ensemble, and do real gigs. On the summer solstices in 2004, and 2005, I was involved in a wonderful event known as The Garden of Memory at the Chapel of the Chimes. In 2004 I made Monorails, and in 2005 I made Cranks. Matt Davignon asked me to join in an interesting evening of sonic droning that he put together called Droneshift over in Oakland at 21 Grand, March of 2005. (Photos are by Peter B. Kaars). 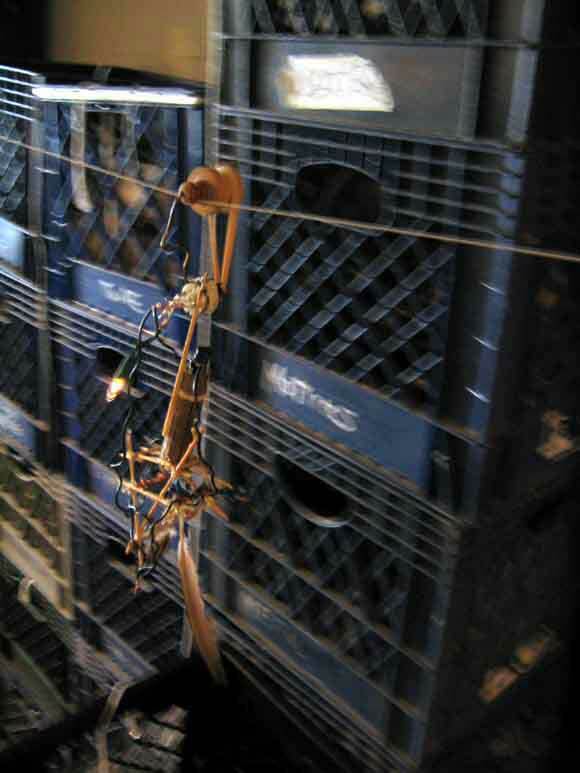 I "played" the grimiest beat-up old electric reed organ you could imagine, (outfitted with a contact microphone), by using coffee stirrer sticks to prop key stops open, and moving my hand over the open chord stops. It worked great, and I had a blast. I finally did a little site for the Wartoys show at the Lab, May of 2003. This year, 2004, I've been writing choral music for a CD I'm working on entitled "In the Cathedral of Airplanes". 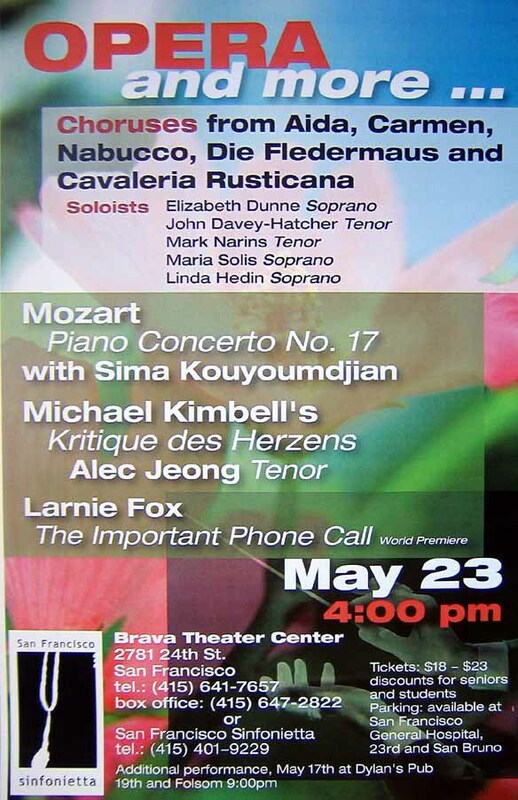 Urs, the conductor of the San Francisco Sinfonietta, has arranged to have it performed by the Sinfonietta's string section. Here's the poster for the world premiere. Here is a finished sound piece from the CD. You can listen to it here. Use headphones and be patient. My brother Tim Fox wrote some strong poems in the mid '80's. While I was learning how to use a computer, I "set them to picture". Anne Crump, of the San Francisco Examiner wrote a decent article about my work. We went to Baja California in September, 2002. Liv wrote a great account of it. She did every thing herself, mostly. I'm flattered that Aaron Thieme, Quiet American, dedicated a piece to me. I wrote a manifesto to artists and the like in response to the 9/11 events and aftermath. October 2001. Join the resulting email list. Josh Churchill and I had a show at Pond in 2001. Here's the invite. Targoodie MP3s online ~ a new soundart page. This is how I use dice to decide where to walk. My mother, Nova June Fox is a wonderful painter. See for yourself. Liv (Daughter) and I made Bodil (Wife) hold still while we did drawings of her after dinner. One person show at the Randall Museum, June through October, 2000. Do you have a minute of free time? Liv and Emma did their first web page. We finally heard from Hana. She's got an interesting project going in Columbia. We just got a new home in San Francisco's well-known Excelsior District. Make that five new paintings in September of 1999. I made four new paintings in September of 1999. We just put a windmill on our roof! Here's a proposal for Point Arena, California. Here's a new view of the last Tire Beach windmill. Bodil and I put up a new, improved windmill on Tire Beach. I wrote a site for Patricia Ravarra, fiber artist and freind. Here's a new page on the windmill Bodil and I built on tire beach July 1998. 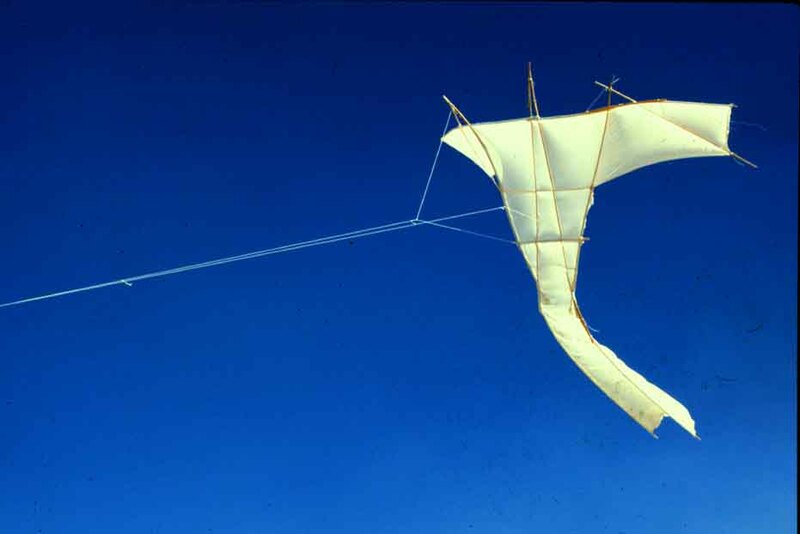 I put up a new page and a new picture of it in flight for the old kite at Burning Man 1996. This "chance" page is new and I'm pretty happy with it. Bodil and I made and wrecked an airplane at Burning Man 1998. I submitted a proposal to Secession Gallery to put up four windmills in and around the lagoon that is between 101 and the Caltrain tracks just south of Candlestick Point, heading into San Francisco. It's worth looking at. I did some photoshop "what ifs". I was really surprized and pleased to find this odd page about me on the www, and... two pictures of the first Tire Beach Windmill!. 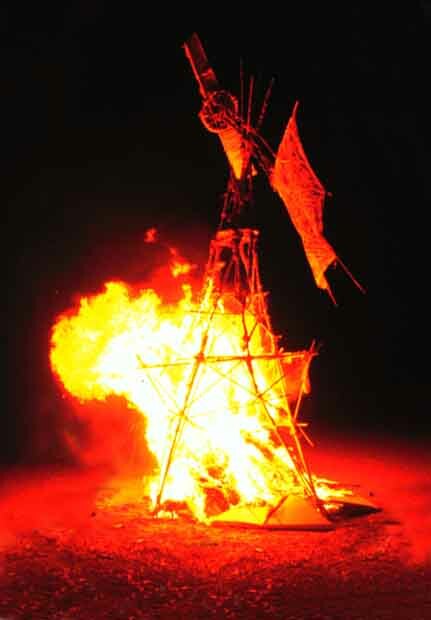 I'm in a show, beginning 7/31/98 at the San Francisco Arts Commision Gallery called The Art of Burning Man. Here is an artist's statement for it. I just put up a very cute picture of girlfriend Bodil walking on stilts for the first time ever at Camp Winnarainbow, June 1998. 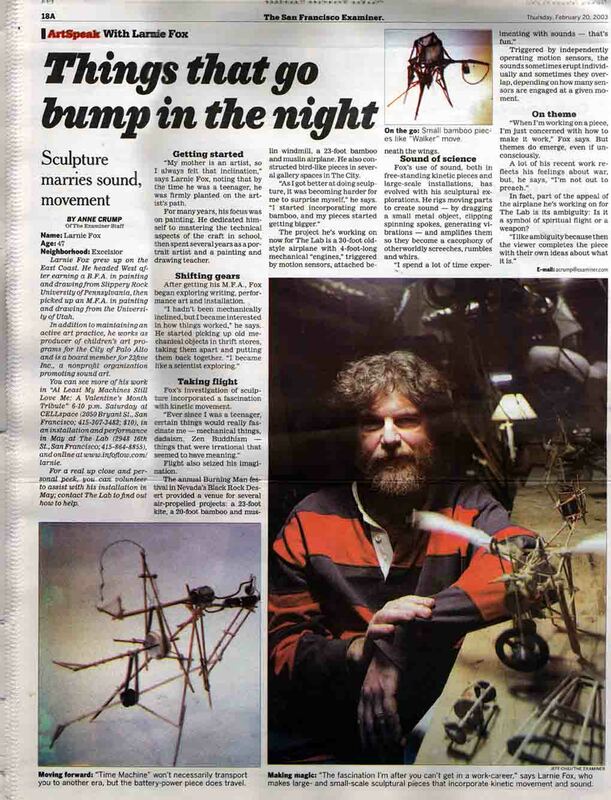 I held two weeks of workshops at my house, May 1998, in which I invited friends, artists & the public to come in and build things with the tvs, reel-to-reels, hairdryers, etc., etc, that I had been collecting for the past twelve years, followed by a culminating event, wake and performance. It was called "Deconstructing Household Appliances", and this is the Manifesto I wrote for it. I just put up pictures of my wonderful girlfriend, Bodil, and her wonderful daughter, Liv. I started a collaborative project. I got a free web site and gave the password to as many people as I could think of emailing it to. A freind I never met shot a beautiful picture of the windmill and put it on his site. 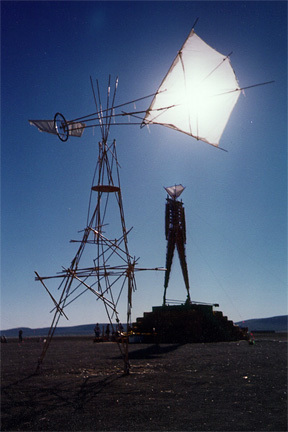 Would you like to see the windmill Charity & I made at Burning Man in '97? Would you like to see a 30 ft. structure that a bunch of second and third grade kids and I made in 1997? Ken Kesey and the Merry Pranksters came to town last spring. Some of us staged an event in homage, and I did some bamboo sculptures for it. It was documented by Sam of Cyberbus.